Daily Illuminator: Yum! Fresh Zombies, Anyone? August 8, 2016: Yum! Fresh Zombies, Anyone? Nothing says "versatile" like "zombies". They can be genuinely scary. They can be funny. They can be romantic. They can be cute and cuddly. They can be tools of capitalism or tools of critical thought. They can be a cereal flavor or a nightmare, a dessert topping or a floor wax. They can be anything – which is why approximately 50% of modern movies are about them. 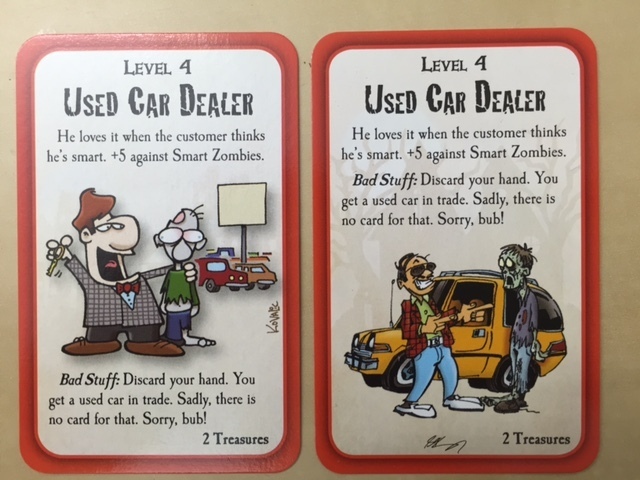 It's this adaptable quality of zombies that made it so easy to choose Munchkin Zombies as one of our Guest Artist Edition games. And it's why we're so excited now to show you more of guest artist Greg Hyland's zombified art! Where John Kovalic's original zombie illustrations are more cartoon-like and family-friendly, Greg Hyland's new Munchkin Zombies Guest Artist Edition – due out in October – is a bit more graphic and loose. Both versions are great in very different ways – like, say, Night of the Living Dead and Army of Darkness, or peanut butter ice cream and mountain pine-scented hand soap. 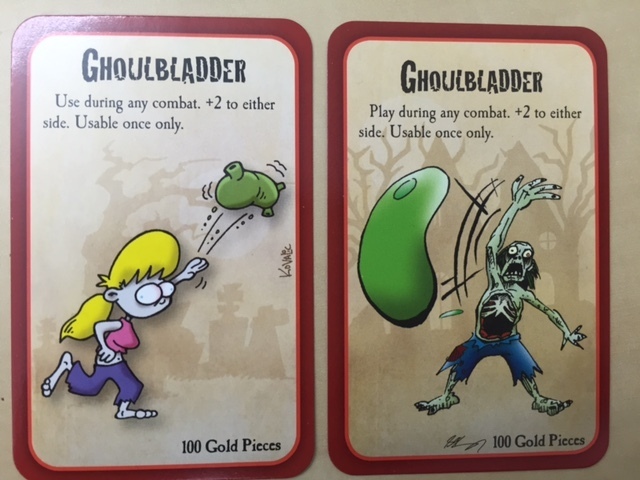 Just look at the Ghoulbladder cards. John's drawing is hilarious, but there's not a gut or a glob of blood in sight. Greg's zombie, on the other hand, has an open chest cavity. Mm-mm, good. 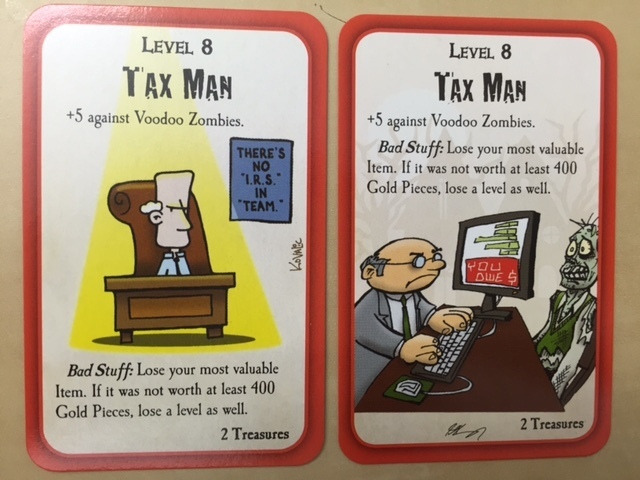 Other cards from Hyland are reinterpretations, like his Slacker or his Tax Man. This is why we're doing these Guest Artist Editions – these cards lend themselves to interpretation. 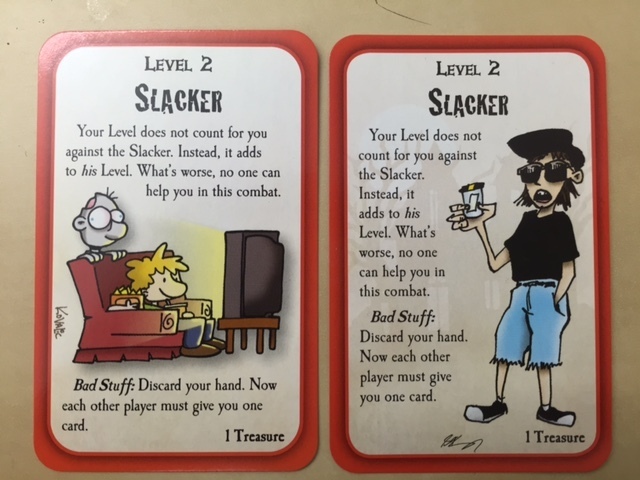 You can see Greg's fresh take on the other 164 cards when the game rolls out in October. Hyland is the creator of Lethargic Lad, a comic strip (and now webcomic) that has been running since the late 1980s. He has worked with us before; he illustrated the original Munchkin Fu, as well as Burn in Hell and Chez Guevara. So when Halloween season rolls around, remember that this game will be in stores, and that it's probably a better use of your money than yet more zombie movie tickets.